The all-blue male Indigo Bunting sings with cheerful gusto and looks like a scrap of sky with wings. Sometimes nicknamed “blue canaries,” these brilliantly colored yet common and widespread birds whistle their bouncy songs through the late spring and summer all over eastern North America. 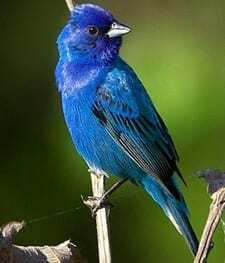 Look for Indigo Buntings in weedy fields and shrubby areas near trees, singing from dawn to dusk atop the tallest perch in sight or foraging for seeds and insects in low vegetation.